Peel the banana and chop it up. Pour the lukewarm milk in a blender and add banana, peanut butter and melted butter. Blend until you get a chunky banana batter. In a separate large mixing bowl add the sifted flour, brown sugar, baking powder and a pinch of salt. Whisk well. Then pour in the banana batter. Stir well and then add the egg. Stir well again into a thick pancake batter. Make sure that there are no lumps in the batter. Pour a drop of vegetable oil in a small pancake pan and place the pan over medium heat until hot. Then add a good scoop of the banana pancake batter (depending on how large or small you want your pancakes to be). Work in batches if you like. Bake the banana pancakes for about 3 to 4 minutes on each side. Then carefully lift the pancake using a rubber spatula to see if it's golden enough and flip it over on its uncooked side. Cook the pancake for another 3 to 4 minutes until golden. Keep it warm on a plate under some tinfoil. Add another drop of oil to the hot pan and another spoonful of the pancake bread batter. Repeat until there’s no batter left. Then transfer the hot banana pancakes onto plates. 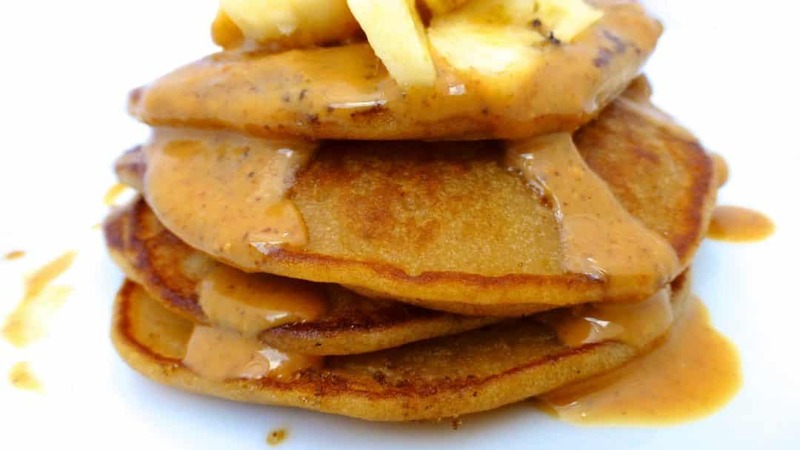 Garnish with a dollop of peanut butter and extra banana slices. Serve hot.